WinStep Start Menu Organizer is an application that designed to help user organizes and cleans Vista Start Menu into various categories. With WinStep Start Menu Organizer, it’s hope that user can easily find the programs as long as they know the categories such as games, utilities, Internet and etc. It is helpful for those have installed a lot of software on Vista which they may found difficulty to find the software. 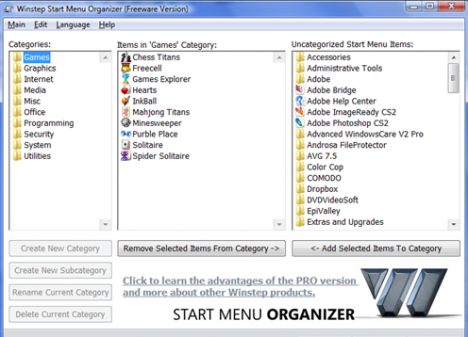 The Winstep Start Menu Organizer features with simple interface which make it easy to use. WinStep Start Menu Organizer has three panels, the first panel is the default folders which the user can arrange all the application in the start menu. The categories defined are Games, Graphics, Internet, Media, Misc, Office, Programming, Security, System and Utilities. The second panel has all the application which is grouped under the selected category. The third panel show all the installed application and the user can add the application into the selected category by clicking on “Add Selected Items to Category” button. Once completed arranged, the Start Menu will changed similar to the first panel. >Ability to search for and remove dead shortcuts. Currently, Winstep Start Menu Organizer available in two version, the free and pro version. The free version only have ten standard categories while pro version offers user to custom their own categories either add, remove,rename or add sub categories.